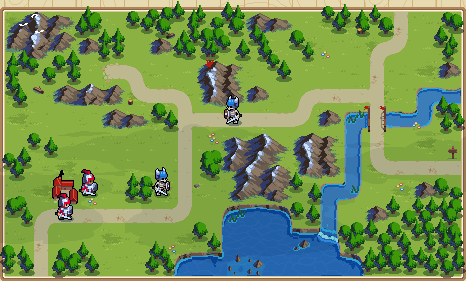 Defeat the invading Felheim forces. The Breach is the 1st mission in Act 1 of the single player campaign. <Emeric>: Congratulations on your coronation, Queen Mercia. <Mercia>: Emeric... Do you really think I'm ready to be a queen? <Emeric>: I have no doubt. You are your father's daughter. <Royal Guard>: Your Majesty! felheim scouts have breached the border! <Mercia>: They're here, in Cherrystone? <Mercia>: I can do this. <Emeric>: I know you can. <Royal Guard>: Wait! Your Majesty! Your crown...! These skeletal warriors are Felheim troops! We must defeat them all to secure this region. We should begin by attacking the closest Dreadswords with our unit of Swordsmen. Right... Let's get this over and done with. Notice the numbers that have appeared next to the two battling units. Yeah! There'sa little number next to each of them. These represent the units' health. They appear when it drops below 95%. The number 5 indicated that the Dreadsword is down at around 50% health. And my Swordsman is down to about 80% health. Got it! Then let's attack the Dreadsword with our second Swordsman. My Queen, may I interject for just a moment? When selecting a target, a Damage Preview will appear above its head. The Damage Preview indicates what damage will be dealt by both units during combat. You see, the health of a unit suggests more than how close it is to defeat. The more damage a unit takes, the weaker its attack power becomes. So a healthy unit is a stronger unit? Indeed! But it looks like your Swordsman will do just fine here. It seems like they're not giving up quite yet. Look! It seems like we've been provided with a new unit type - Pikemen! This might be a good time for you to learn about Critical Hits. All units have conditions under which their attacks are stronger. We call these attacks Critical Hits. Do not worry, my Queen. This information is easy to find. Let me show you how to find information about a unit's 'Crit'. This is the Tile Info Screen. Here, we can find useful information about our selected unit. This part gives us a good overview of the unit. Hmm... the Pikeman Crits when adjacent to another Pikeman! You can bring up this Info Screen on any unit, terrain or structure. Use it often, and you'll learn fast! Alright! I'll make sure to check it often. When you're ready, you can close this window. We should make sure that the Pikemen stick together. We've lined up our first Pikeman. Let's attack the Dreadsword with our second Pikeman! Let me draw your attention to the Damage Preview once more. Oh, the arrow is flashing! Well spotted. A flashing arrow in the Damage Preview is a good sign. It indicates that you're about to land a Critical Hit! ...the second Pikeman dealt a Critical Hit! Keeping your Pikemen together will ensure a stronger offence. When encountering a new unit type, it's important to learn about their Crit. I'll leave you to defeat the rest of these Felheim troops. Thank you, Emeric. I couldn't do this without you. <Emeric>: A good start, but Felheim won't stop there. We must remain vigilant. <Emeric>: Yes. And in greater numbers. <Emeric>: But now they're coming. and they won't stop. <Emeric>: Well, we should make a move. The undead are likely to be advancing upon other parts of the kingdom. <Mercia>: Emeric... Do you think Valder will come to Cherrystone himself? <Emeric>: Yes, Your Majesty. I do. <Royal Guard>: Your Majesty! Wait! This page was last modified on 15 March 2019, at 18:34.